I am definitely starting to struggle 🙁 Thank you if you are managing to put up with my infrequent blog posts. My blog post rate has been horrid…. Wasn’t that rubbish? A post and a half a month on average. In my defense – I have made quite a lot of large garments…But I’m amazed you still come and visit – Thank You readers for sticking with me – must do better next year! Grey and cream stripe cardigan from the wonderful Purl Alpaca Worn regularly – desired by several of my female work colleagues! Huge, red, chunky roll neck jumper in fisherman’s rib. Worn a bit when it’s very cold – not been cold enough this year. Pale blue funnel neck pullover with yarny souvenir from work trip to New York Ben put it in the washing machine and tumble dryer and shrank it. I’m still upset at the loss, even after he bought me a lovely replacement jumper! Red chunky hat Doesn’t really suit me – waiting for a very cold spell to wear it. Cream cable jumper with peplum – based on Icon dress Loved to bits, worn a lot and much admired. Fairisle scarf with colourful rows of kitten heads A massive fave and worn almost daily – Love this! Cropped lace Cardigan in yellow Rowan fine lace and Kidsilk Haze bbeautifulbut they meant it when they said “cropped”. I must say I love your blog and all the wonderfull knittin you make. I love ‘honesty’ and ‘flossie’, I just love them!! hugs & kisses. Glad you’re keeping going, think yours was possibly the first blog I read and is still a favourite so don’t give up! Happy Blogiversary! I too really enjoy reading your blog and seeing your beautiful knits.They are all stunning but my favourites have to be Captivate and the kitty scarf. I’ve only just discovered both the joys of knitting and your blog so please don’t stop!! My favourite has to be the captivate cardigan, it’s exactly the kind of thing I love wearing. 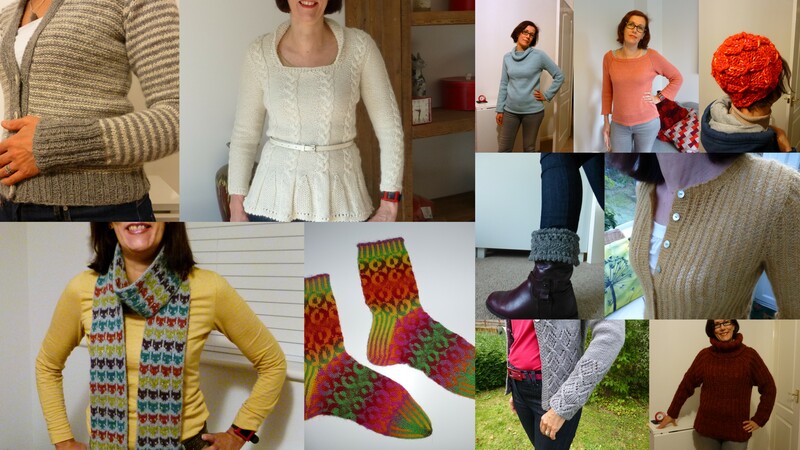 Happy knitting and blogging for 2015, I look forward to seeing your new projects! You have knit some beautiful things Susan, and several of them have been quite ‘meaty’! So don’t feel bad. I hope 2015 is a happier one for you and Ben and the girls. I was so, so sad when you told us about Purcey. Animals leave such a hole in our lives. Do keep blogging, pretty please! Happy New Year – hope this one’s better for you. Many years ago I binned all my handknits, all my stash and all my patterns and didn’t knit again for about 3 years. By comparison, you’ve been really productive. Love the cropped cardigan. Happy Blogiversary! I absolutely love your socks and wish I could knit socks like them.